This year, Family Equality continues our tradition of advocacy and collaboration as presenters at the annual Creating Change Conference. Taking place in Detroit, Michigan from January 23-28th, the conference brings together thousands of attendees from all over the country. The conference has been catalyzing change across the country for three decades, with the first Creating Change starting in 1988, after the 1987 National March on Washington for Lesbian and Gay Rights. After the march, the National LGBTQ Task Force began the process of building a national organizing and training conference where everyone could be an avid learner, and where activists and organizers could learn from one another. The conference opens on Wednesday, January 23rd with a day long Racial Justice Institute, followed by 18 options for day long institutes the next day. These institutes cover a variety of topics from “Creating LGBTQ Cohesion Across Generations,” to “Unión Equals Fuerza,” “Queering the Playbook for Religious Resistance,” and more. Throughout the conference, there are multiple workshops, gatherings, and panels to inspire and activate diverse perspectives and attendees. 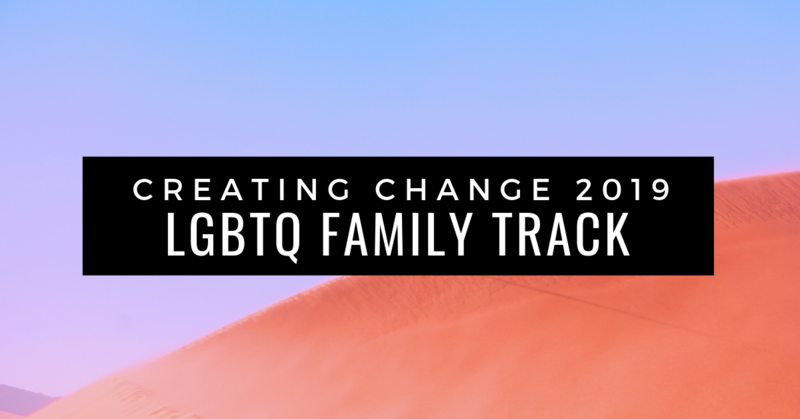 Family Equality is the leading organization supporting LGBTQ+ families and those who wish to form them, so we will be playing a key role in providing family formation tips, advocacy strategies, and collaborative networking opportunities all throughout the conference. 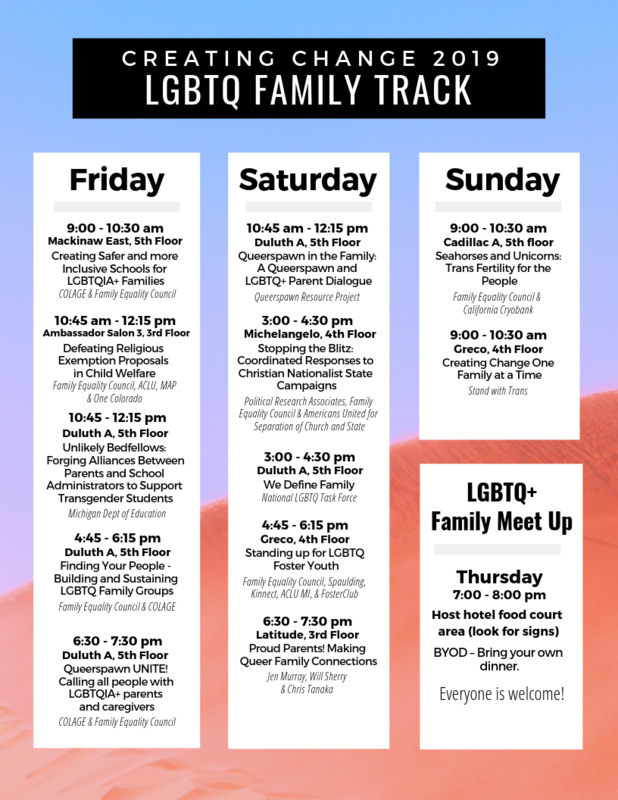 Below is a schedule of Family Track activities at the Creating Change Conference happening Thursday through Sunday. As an organization, Family Equality is committed to sharing the perspectives and lessons we take away from Creating Change, making sure that the knowledge and change that is activated within the walls of the conference get echoed out to the larger community.